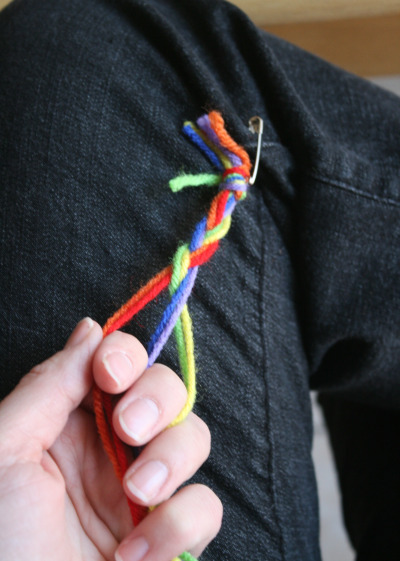 We’re celebrating St. Patrick’s Day by making Rainbow Friendship Bracelets. These are easy to make and fun to give out to friends on this Spring holiday! 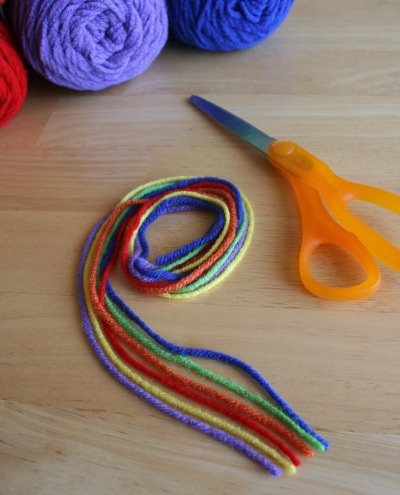 Roll out your yarn and cut each color to 18 inches long. 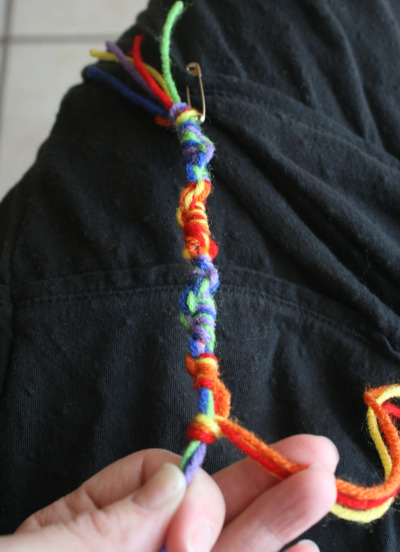 Then tie a knot at the top with all 6 colors of yarn. 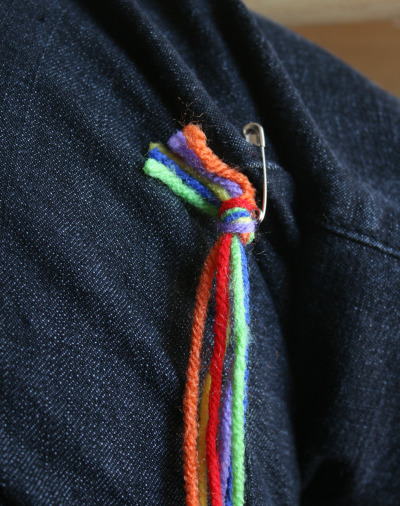 Attach a safety pin to the top of the knotted yarn. 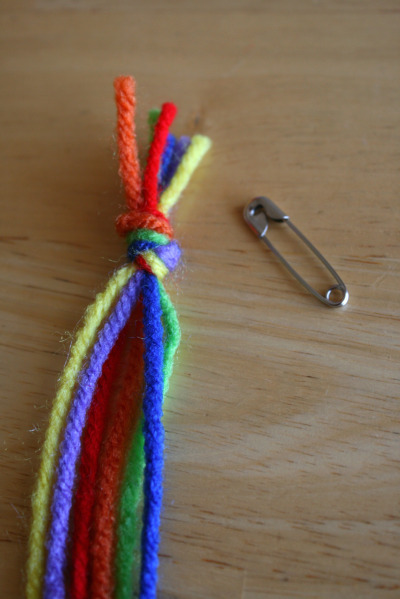 Then you’ll need to attach this same safety pin to something firm as you braid your yarn. I like to attach it to the seam in my jeans. Or you could attach it to your sock. I’ve even attached it to the seam in my couch and sat on the floor as I’ve braided. Now start to braid. I did this first one in a simple braid, putting 2 colors together, for 3 groups of yarn to braid. Here’s a bracelet I made with knots all down the length of yarn, alternating each color after 5 knots. Here’s a bracelet we made by adding a bead into each thread as I braided. 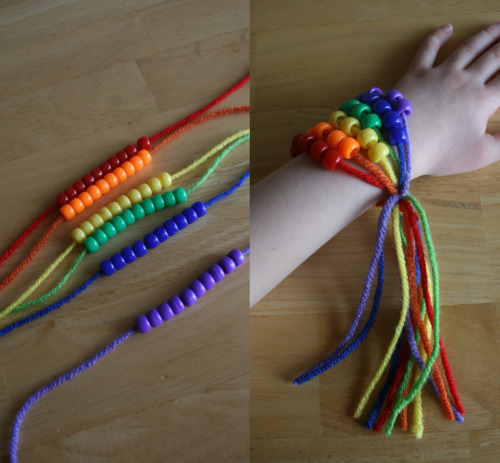 Or here’s a beaded bracelet with 10 beads on each color of yarn, then tied together. 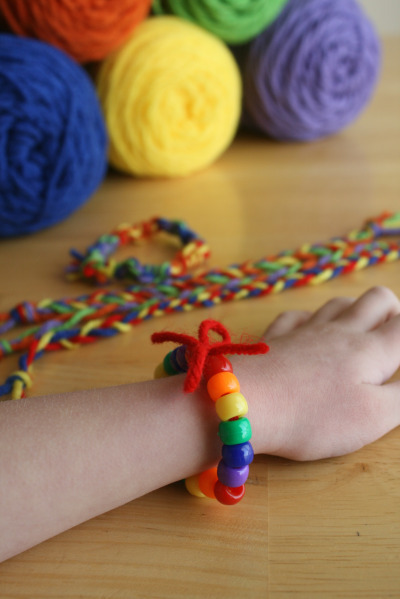 We left the yarn hanging down a bit off the bracelet to make a fun rainbow stream! 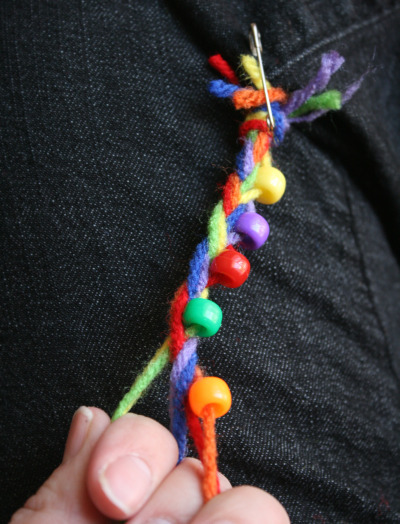 Once your bracelets are made, you can either remove the safety pin and tie them together in a knot, or attach the other end of the yarn to the safety pin, using it like a clasp. With so many ways to design your bracelets, you can now give them to all your friends. 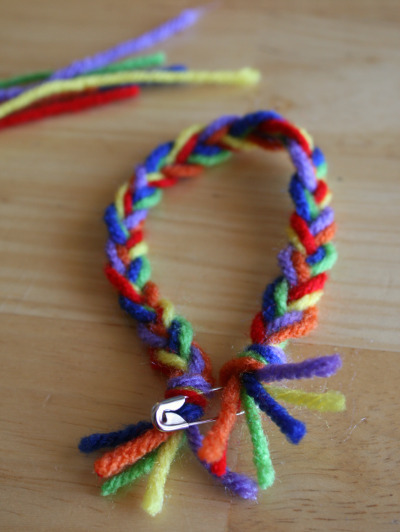 It’s even more fun as a play-date or party and make them together, swapping bracelets with friends. So fun. I remember making these! Cute! I love the idea of yarn for young kids. We’ll be making these this week.